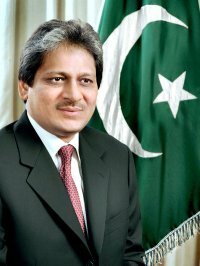 Sindh Governor Dr Ishrat Ul Ebad Khan has congratulated newly elected president of Arts Council of Pakistan Karachi, Ahmed Shah, and other office-bearers on winning the election. In a felicitation message here on Monday, he hoped that the newly elected office-bearers would come up to the expectation of those having an interest in fine art and culture. The governor said that Karachi is not only the economic hub but also a centre of learning and culture. He assured that he would extend every possible assistance towards the promotion of the activities of the Arts Council. 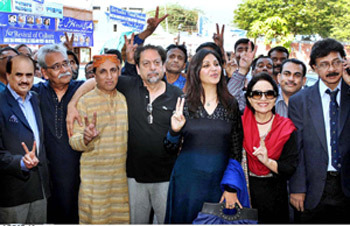 Ahmed Shah, along with his panel, once again clean swept the Arts Council of Pakistan Karachi (ACPK) elections for the year 2012 with significant distinctions, announced the results, declared by Commissioner Karachi Roshan Ali Sheikh, here on Monday. As per the details, Shah got 2,001 votes and became president of the council; while on the other hand his rival Omer Shareef gained 1,068 votes. Similarly Shah’s panel candidate for vice president Mehmood Khan got 1,700 votes, his rival Rizwan Siddiqui managed to get 1,299 votes. Prof Ejaz Farooqui of Shah’s panel candidate for general secretary got 1,995 votes as compared to his rival Azfar Rizvi who scored 1,010 votes. Amin Yousaf succeeded as joint secretary with 1,903 votes, while his rival Khalid Aaraen scored 1,130 votes. Huma Meer, a candidate for treasurer, scored 1,643 votes, while her rival Najam Uddin Shaikh got 1,418 votes. All of the candidates for governing body, belonging to Shah’s panel, were also remained successful. Sehar Ansari gained maximum votes 2,059, while Fatima Surayya Bajya got 2,044 votes, Shahnaz Siddiqui 1,890, Farhad Zaidi 1,889, Dr Qaiser Sajjad 1,887, Athar Waqar Azeem 1,867, Qudsia Akbar 1,835, Abid Ali 1,823, and Naqash Kazmi received 1,811 votes.